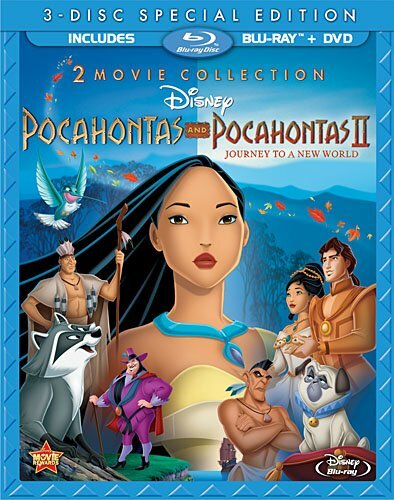 Article first published as Blu-ray Review: Pocahontas and Pocahontas II: Journey to a New World on Blogcritics. I have to give Disney quite a bit of credit for the courage it took to tackle as potentially controversial a project as Pocahontas (1995), now available on Blu-ray. Of course, the year before was a banner year for the company, still the only commercially viable name in animated features at the time. After the steadily increasing box office of The Little Mermaid (1989), Beauty and the Beast (1991), and Aladdin (1992), The Lion King was such an across-the-boards smash in 1994, the sky seemed the limit for Disney. Abandoning the world of talking animals, fairy tales, and genies voiced by Robin Williams was a very risky proposition. 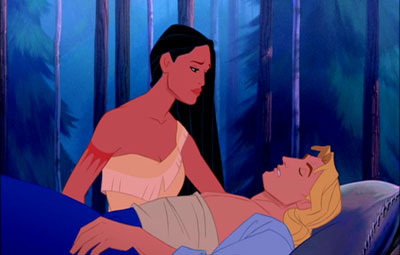 Pocahontas was an ambitious departure, having been based on real historical figures and events. Chronicling the arrival in North America of English explorers in the early 17th century and depicting their clashing, violent encounters with the Native Americans is not an easy sell, at least not for a G-rated family film. The story of Pocahontas (voiced by Irene Bedard, with singing by Judy Kuhn) and her relationship with Captain John Smith (Mel Gibson, who does his own singing) is based far more on folklore than historical fact. Of course, as has been pointed out many times, the filmmakers were not trying to teach a history lesson. They take the legend as their starting point and extrapolate from there. The Englishmen arrive by ship with Governor Radcliffe (David Ogden Stiers) leading them on an expedition for gold in the New World. Captain Smith is initially nonplussed by the New World and has little interest in stealing gold from the natives. He meets Pocahontas, who is undergoing a bit of a crisis because she has no interest in being married off to the Powhatan warrior, Kocoum. Despite her father Chief Powhatan’s mandate that the tribe not affiliate with the white men, Pocahontas and Smith bond and form a serious relationship. Radcliffe similarly commands his men not to fraternize with the natives. “I say anyone who so much as look at an Indian without killing him on sight, will be tried for treason and hanged,” declares Radcliffe. Again, this isn’t exactly kid-friendly stuff. To combat the unusual maturity of the material, the filmmakers have inserted a few cute animals, notably Meeko the raccoon and Percy the pug. They don’t talk, but they do provide comic relief and something for the youngest viewers to focus on. Some of the fantasy elements come across as overly hokey, such as Willow the talking tree (voiced by Linda Hunt) that serves as a spiritual advisor to Pocahontas. There’s also a sequence in which an elder tribesman conjures images out of smoke. These attempts at showing the Native Americans’ spiritual side in very literal terms doesn’t work that well. But ultimately, Pocahontas is a well-made animated film that—even though it’s not considered a classic—still stands as a serious triumph for Disney. The Oscar-winning song score by Alan Menken and Stephen Schwartz is loaded with memorable melodies and lyrics, none more so than “Colors of the Wind.” And the unhappy ending was another bold move that seals the film’s status as an anomaly in the Disney catalogue. And if it has ever inspired any kids to learn more about the real Pocahontas, or Native American culture in general, than that’s a bonus. The quickie, direct-to-video sequel Pocahontas II: Journey to a New World is nothing more than quick-bucks product from the Disney animation B-team. Most of the voice cast returns, save for Mel Gibson. His brother Donal Gibson fills in. 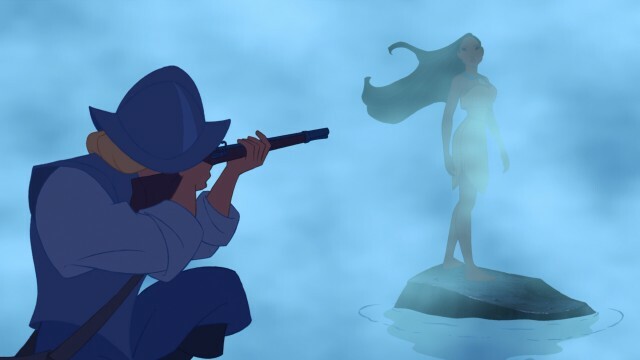 In kind of a reversal of the first one, Pocahontas travels to England—a “new world” for her—after Captain Smith is presumed dead following a confrontation early on (he reemerges in the third act). 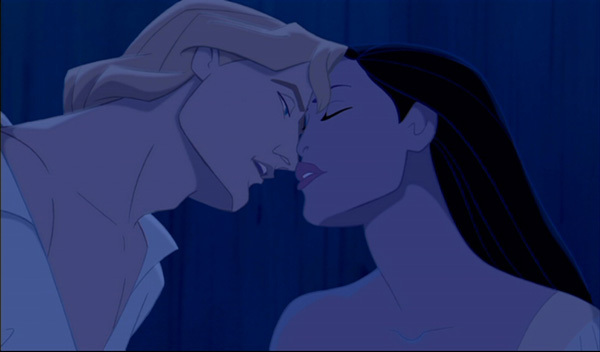 She voyages to England with her replacement boyfriend, John Rolfe (Billy Zane). Meeko the raccoon, Percy the dog, and Flit the hummingbird are all in tow, of course. This one is strictly for kids, as the animation has an overall flat look. At a mere 73 minutes, the film drags under the weight of too much plot. Pocahontas and its sequel, both on the same Blu-ray disc, look excellent with 1080p transfers. The original film looks marginally better, but that’s largely because of how far superior the animation is. Pocahontas is vividly colorful, with even the potentially drab earth tones that dominant the palette looking rich. The image is perfectly clear. A fair amount of the film is set at night, but the images are equally strong even when intentionally dim to simulate low lighting. The sequel features a much less finely-nuanced style, but the transfer itself can hardly be faulted. Clarity remains strong and the generally bright-colored film almost looks better than it needs to (for such a cheap knock-off). Both films are presented with 5.1 DTS-HD Master Audio soundtracks. Predictably, the more robust of the two is easily the first film. More care was obviously invested in crafting an immersive audio experience with the original. There’s nothing wrong with the audio on part two, it just doesn’t utilize the surrounds as much as the first. The songs sound far better on the original, making use of the full spectrum, including plenty of LFE presence. The sequel has a thinner and more front-centered mix. Dialogue is totally trouble-free on both films. As for supplemental features, I lead with the bad news. Most of the previous DVD’s featurettes are relegated to a “virtual vault” that is only accessible through BD-Live. Personally, I think this is a terrible idea, but I guess it’s a precursor for a future when we’ve done away with physical media altogether. While we’re still buying and selling actual discs, I’d prefer all the material to exist on it and not via BD-Live. Then again, I guess it’s good that all these additional features are accessible in some form. Rant over, just beware that if you don’t have your BD player connected to the internet, you won’t be watching this stuff. What is physically on the disc is an underwhelming assortment, the best of which being a rather impassioned commentary track by producer James Pentecost and directors Eric Goldberg and Mike Gabriel. This is a pretty interesting track with lots of good information that makes a strong case for the quality of the film. “Drawing Inspiration: The Lost Story of Hiawatha” is a short featurette that offers details about an abandoned animated film. Deleted scenes (presented as storyboards), a deleted song, and the short featurette “The Music of Pocahontas” round out the special features. The package also includes two DVDs, one with the first film and the other with the sequel (they are stacked right on top of each other on the same spindle). 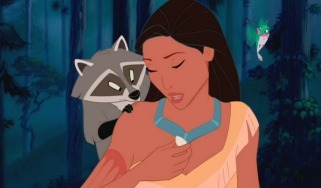 Taken purely on its own terms, I lean towards Pocahontas being a minor classic. And I do respect Disney’s heartfelt efforts. Believe it or not, despite all the nitpicking about historical accuracy, on the commentary track the filmmakers explain just how much research did go into the production. The sequel is admittedly a little harder to defend, but its inclusion makes the Blu-ray a good value. Think of it more as a bonus feature than anything approaching the original’s equal.